If one's fondness of a particular restaurant is measured solely by the frequency of visits, then Neighborhood must be my favorite restaurant in the whole world - as I generally make about 10 visits per year. I'm back tonight for the 13th visit this year, as a few of us help Ro Ro celebrate her birthday. 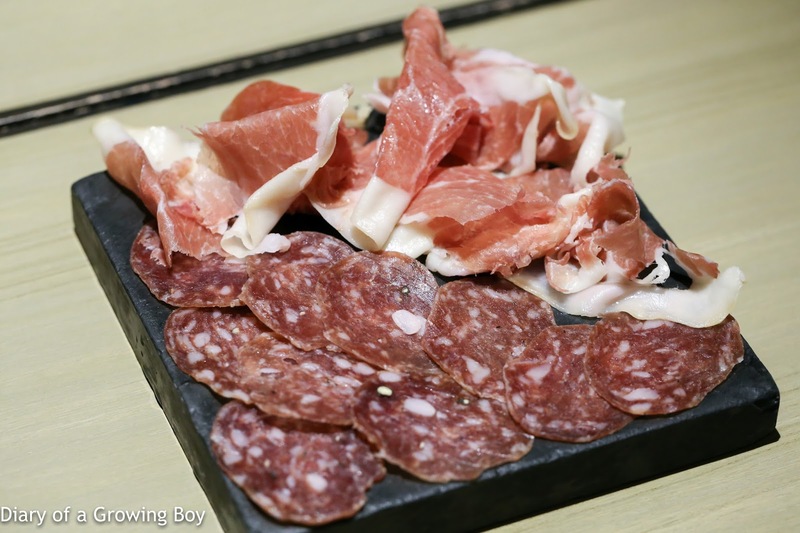 Saucisson "noir de Bigorre" / culatello di zibello "Massimo Spigaroli" - these are always delicious and flavorful. 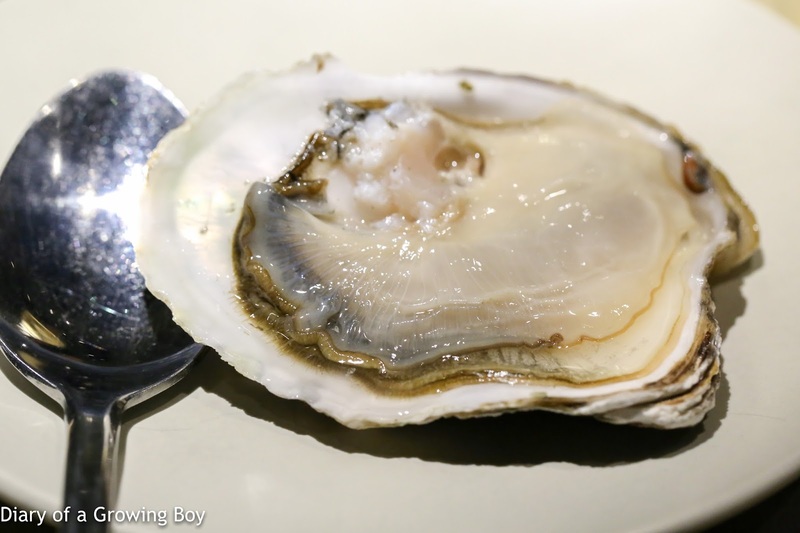 Pacific oyster superior - these were some pretty damn big oysters... and pretty salty/briny. This was nothing short of heavenly for me. 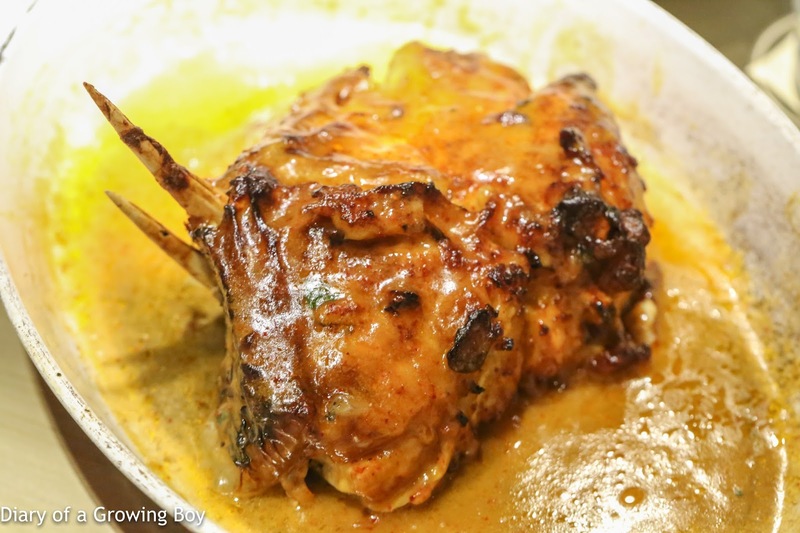 Very tasty and fragrant, and the fat delivered very good depth of flavors. I could have done without the rest of tonight's dishes... just give me as much bread as I can stomach and a tub of this. I'll be content. 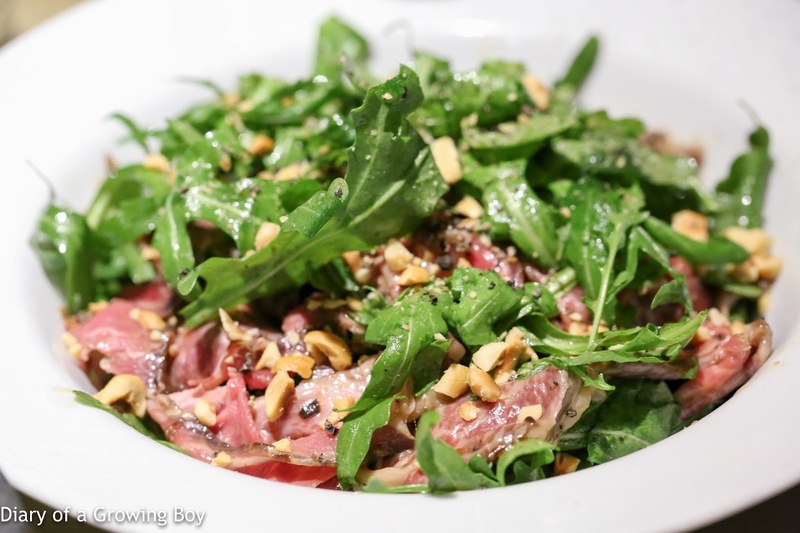 Rocket salad / dry-aged beef - this was actually pretty damn good... 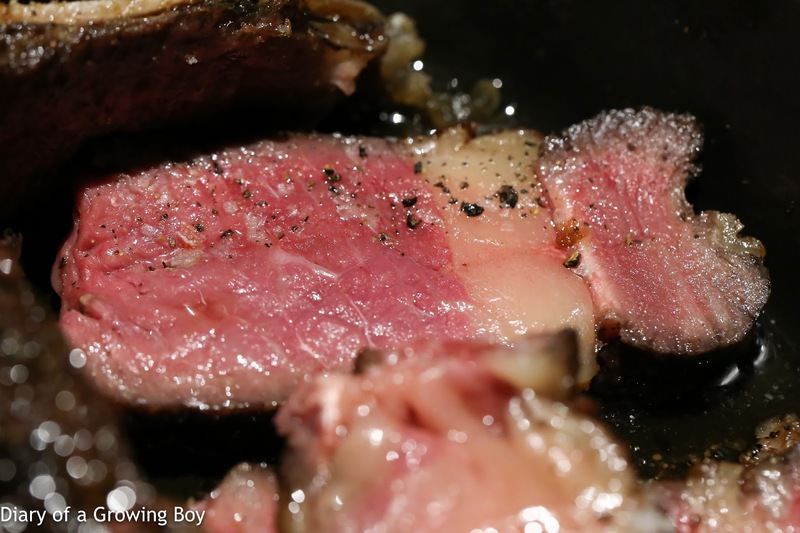 The dry-aged Australian beef was pretty tasty, and the hazelnuts provided a nice crunch along with their beautiful fragrance. Smoked eel / foie gras / figs - WOW! This was seriously good! 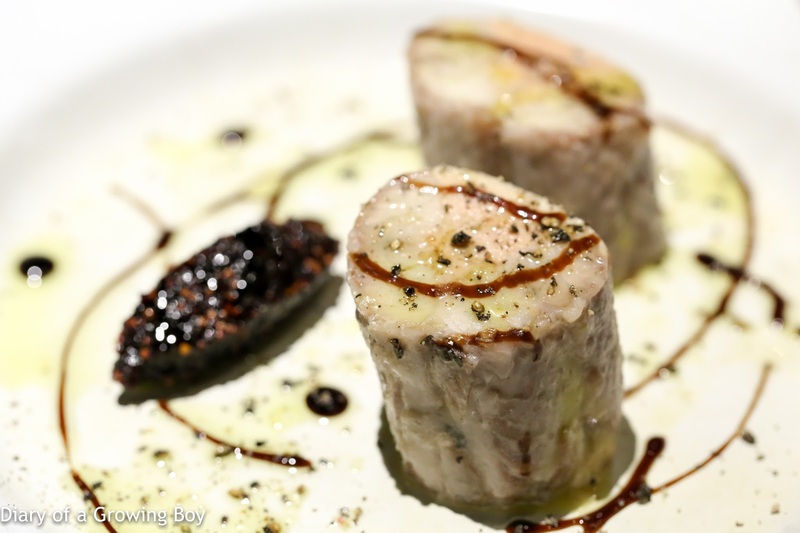 The smoked eel was stuffed with foie gras pâté, and it's a combination that has been proven time and again. This was certainly very elegant, and came with a small quenelle of fig jam. Very impressive. Shortly after we started, Sato-san and Takano-san walked through the door. They were dropping by after finishing mis en place for their 4-hands event with Tokuyoshi Yoji at their restaurant - starting tomorrow evening. We invited them to join us at our table, as we had two extra seats anyway. 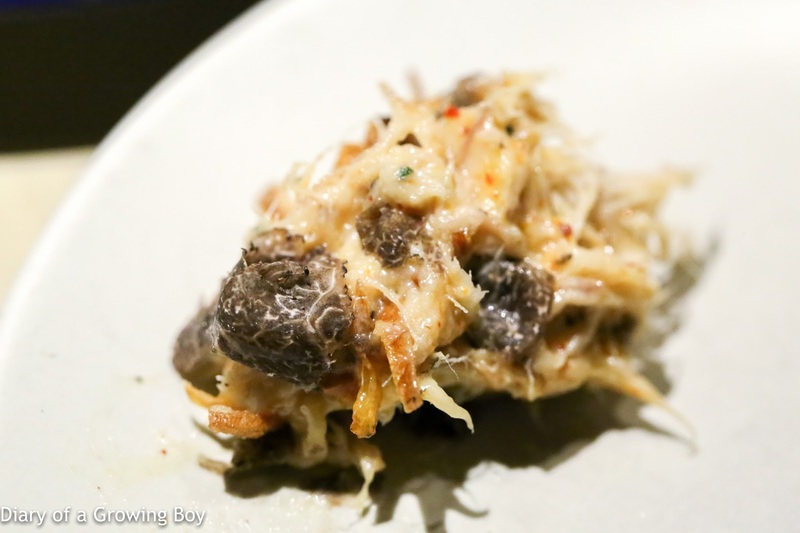 Besides, as I keep telling my friends, the dining experience at Neighborhood can be totally different between a small group and a large group - and I was fairly certain that Sato-san had not tried the larger, special dishes. My friends know that I'm a huge fan of Sato-san's, and I admire his dedication and hard work. Another anecdotal evidence? He politely declined when we offered him the raw oyster. Why? Because he doesn't want to take any chances with getting sick from eating it. After all, the next few evenings are very important for him, and he wouldn't want to not be in top shape. RESPECT! 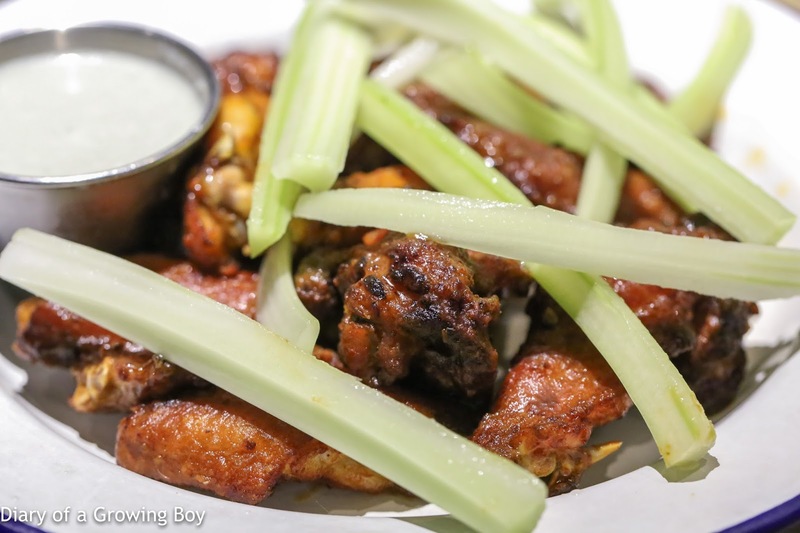 Buffalo chicken wings / Roquefort - surprised to see "ordinary" buffalo wings on the menu here, but there's nothing wrong with these! 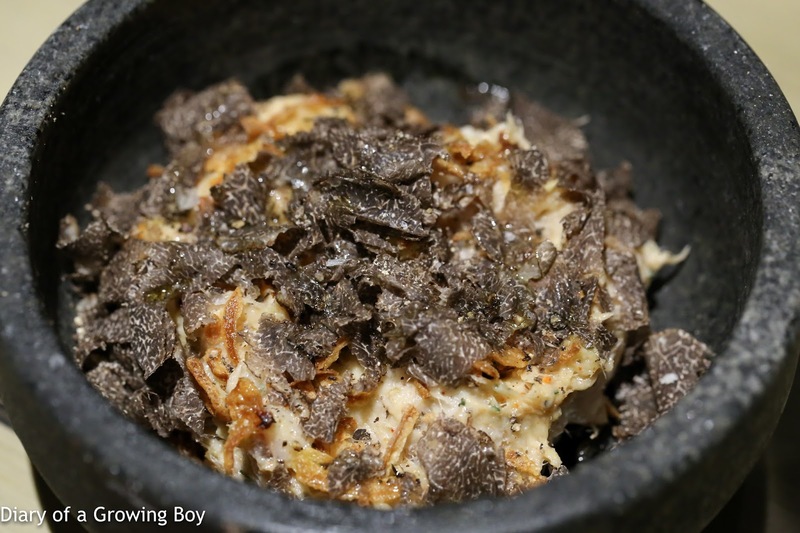 Pigeon eggs / curry and panko butter - The Man in White T-shirt decided to send us something a little different from what we've been having for the last few months. 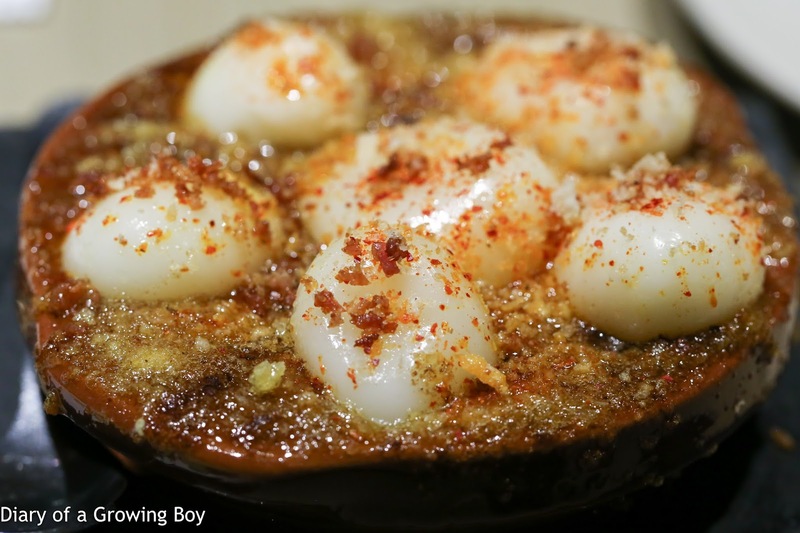 The curry and panko (パン粉) butter is said to have been inspired by devilled eggs. Very nice. 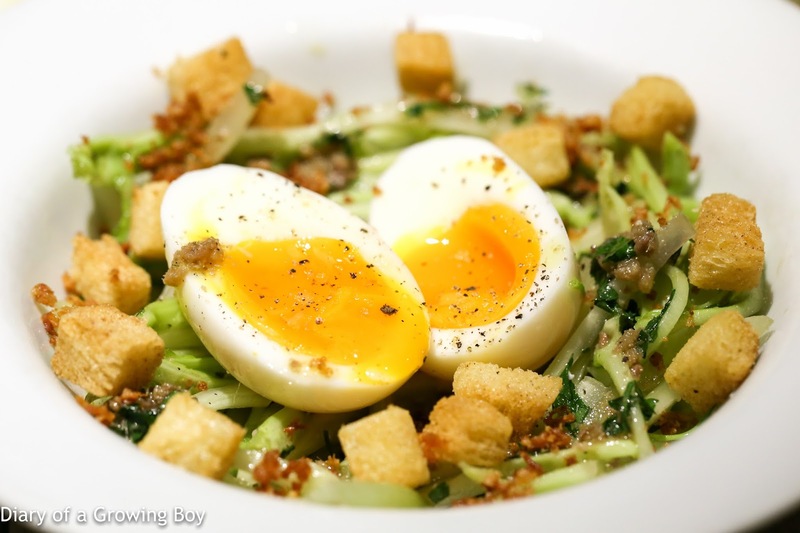 Puntarelle salad / poached egg / anchovy - almost like a Caesar salad with the croûtons, the flavors of the anchovies were pretty nice. The bits of parsley also added some extra fragrance. 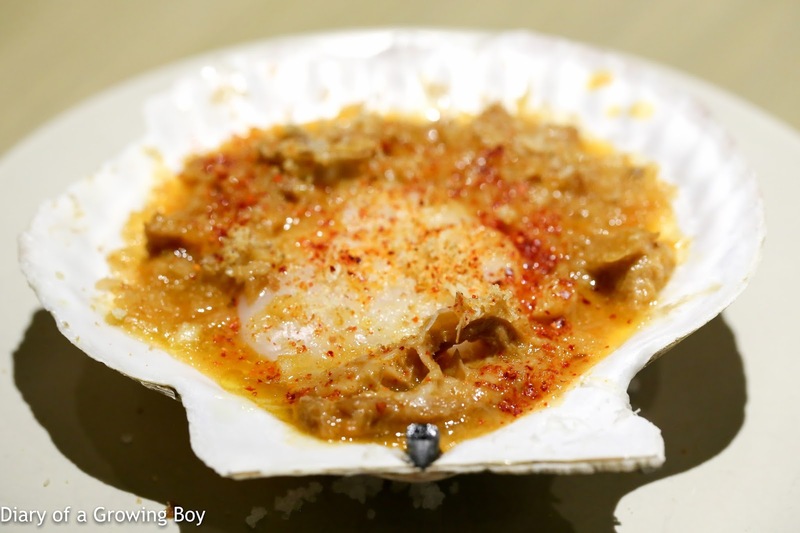 Hokkaido scallop / beef tripe gratin - instead of having the beef tripe gratin on its own as we're used to, it's now served in the half-shell of a Hokkaido scallop - along with the scallop adductor muscle and coral. Nice and spicy. And delicious. 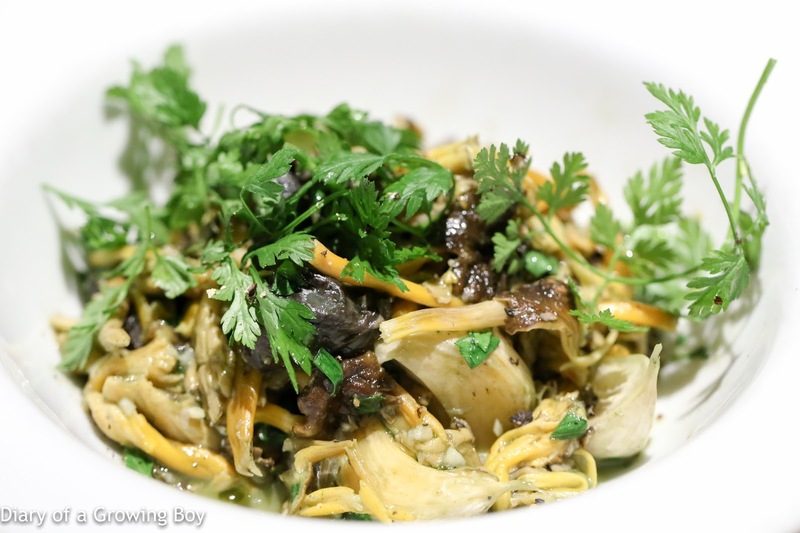 Yellow chanterelle / escargot - beautiful combination... especially with chervil. Clam risotto - WOW! I loved this! 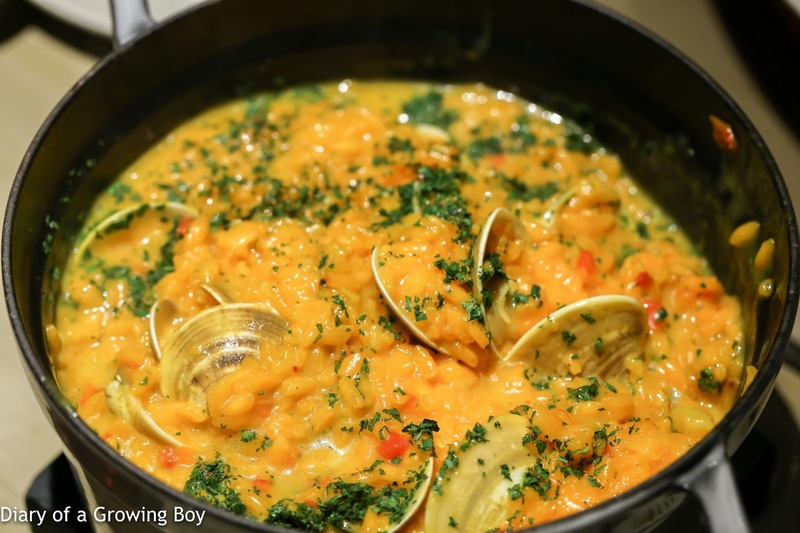 A nice, big pot of pretty wet risotto full of saffron flavors along with some capsicum, plenty of chopped parsley, and lots of clams. YUM! Giant grouper fin - this "little" piece came from a giant grouper that weighed around 150 catties (90 kilos). 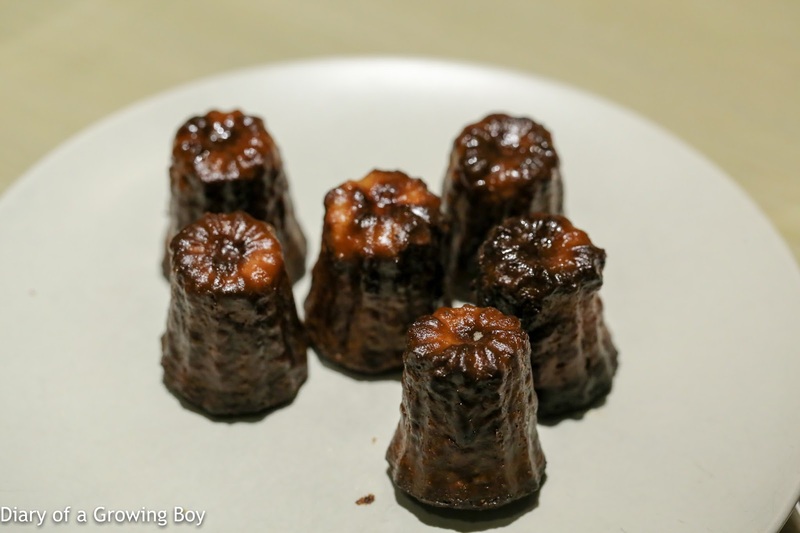 It was roasted with fish broth. 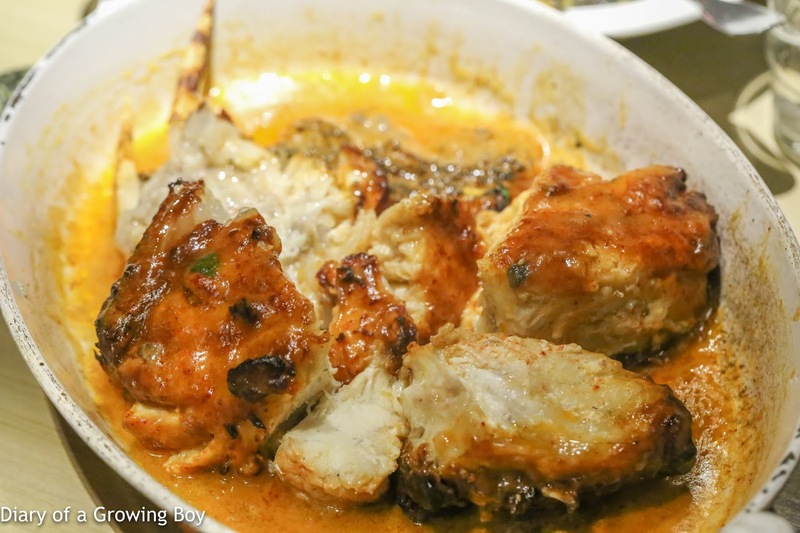 The flavors were delicious, and it was quite something to partake in a fish that size, but not surprisingly the roasting process resulted in the fish being slightly overcooked. The meat was still relatively tender, but slightly on the dry side... and certainly not as supple and succulent. 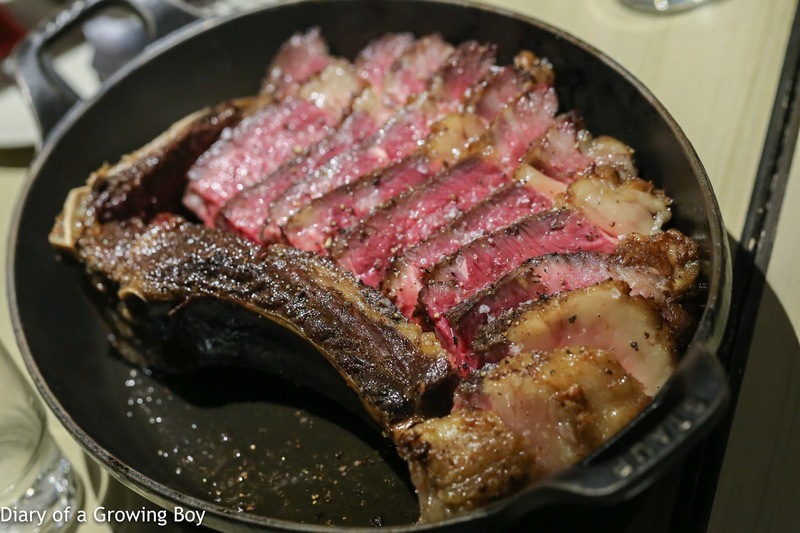 Rangers Valley Black Market porterhouse - one of tonight's TWO big steaks. 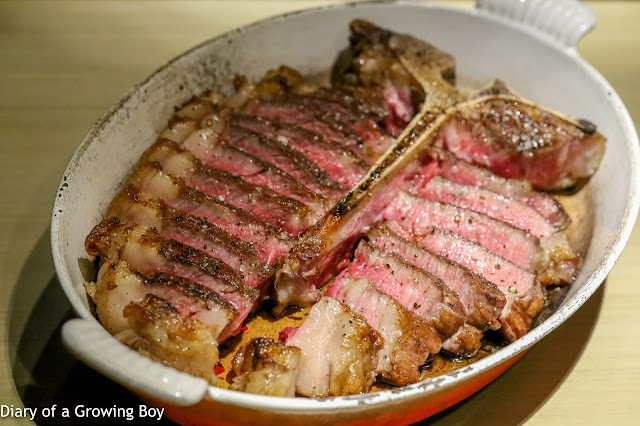 Well... it IS Ro Ro's birthday, after all... so how can we do without lots of 肉肉?? This seemed slightly more cooked than I had expected, but still very, very delicious. I took a small slice from the tenderloin side. 100 days dry aged Rubia Gallega - my favorite beef. The doneness was perfect. Sooooo delicious. Soooo full of flavor. 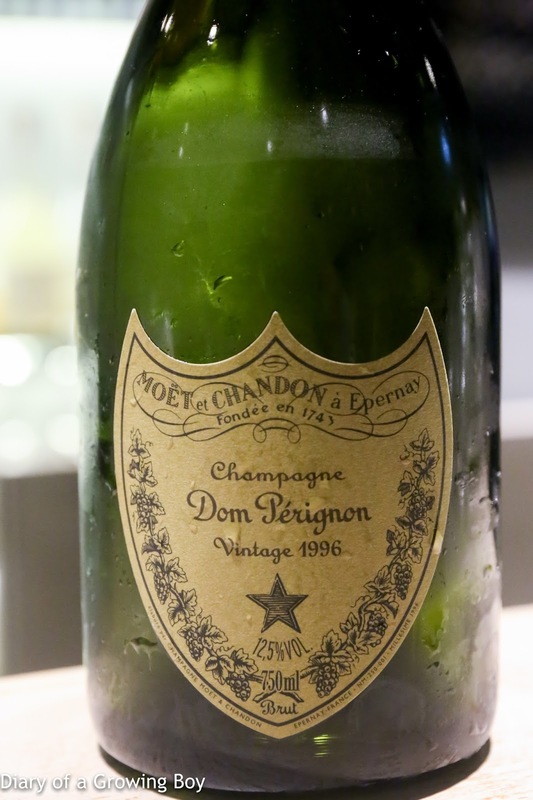 1996 Moët et Chandon Cuvée Dom Pérignon - very ripe and mature. Softened up on the palate, and so round now. 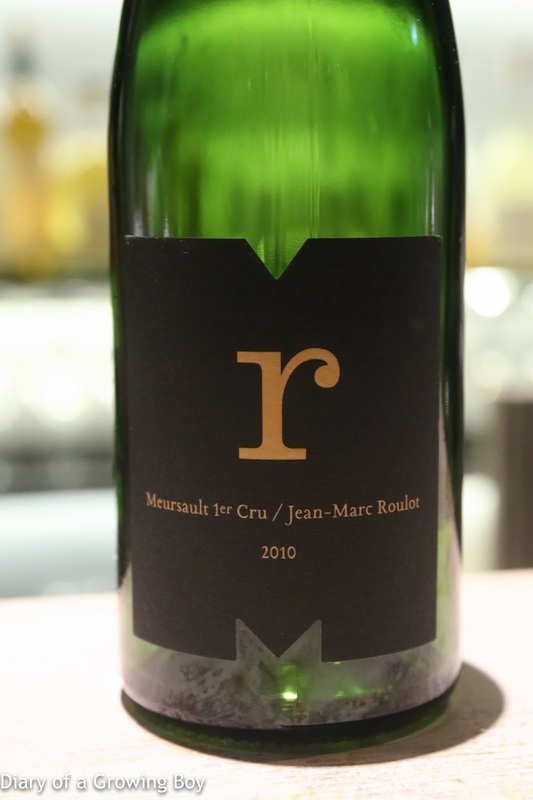 2010 Jean-Marc Roulot Meursault 1er Cru - nice and ripe, with acidity on the back end. 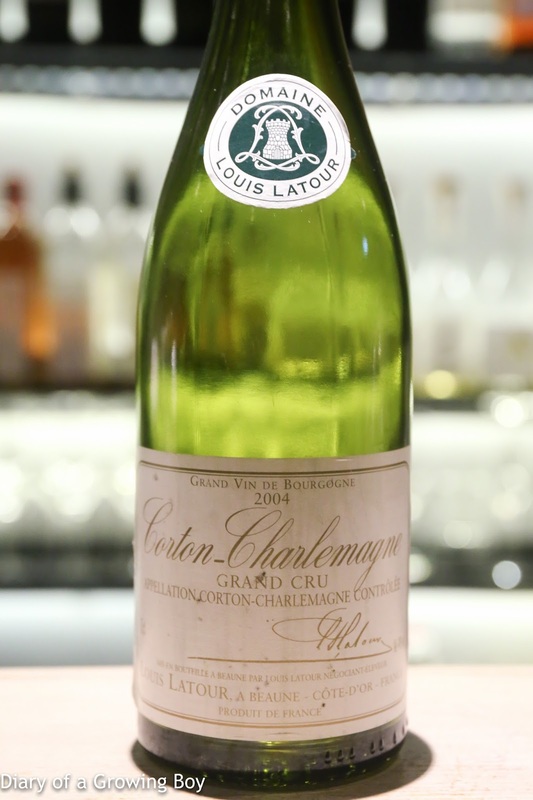 2004 Louis Latour Corton-Charlemagne - ripe on the palate, but with good acidity and flint on the finish. 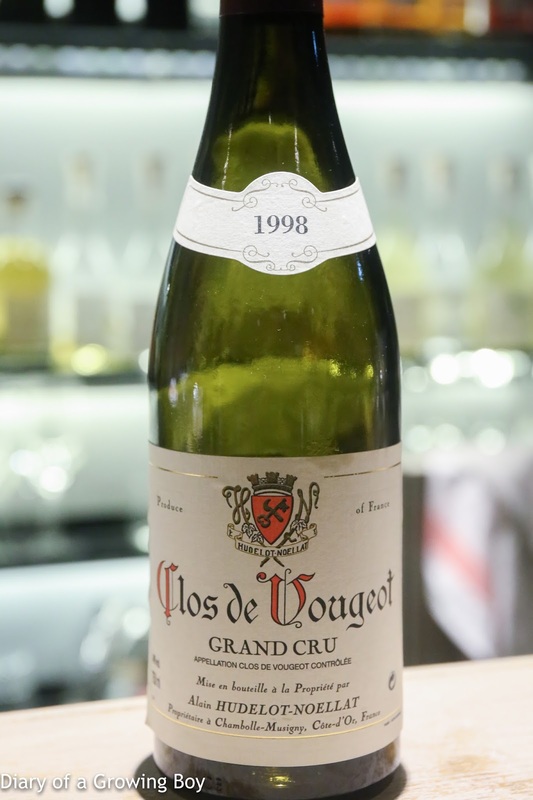 1998 Hudelot-Noellat Clos de Vougeot - sooo fragrant and fruity. 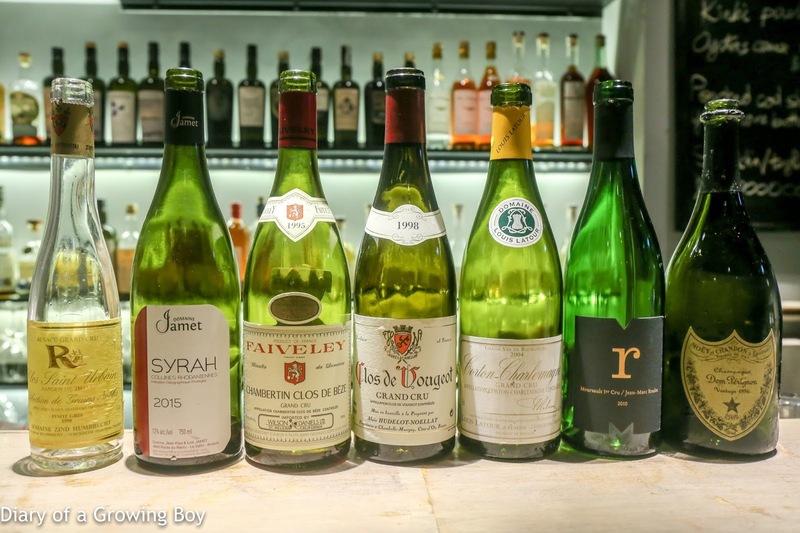 Soft on the palate now. Actually turned out to be a little too late on the palate. 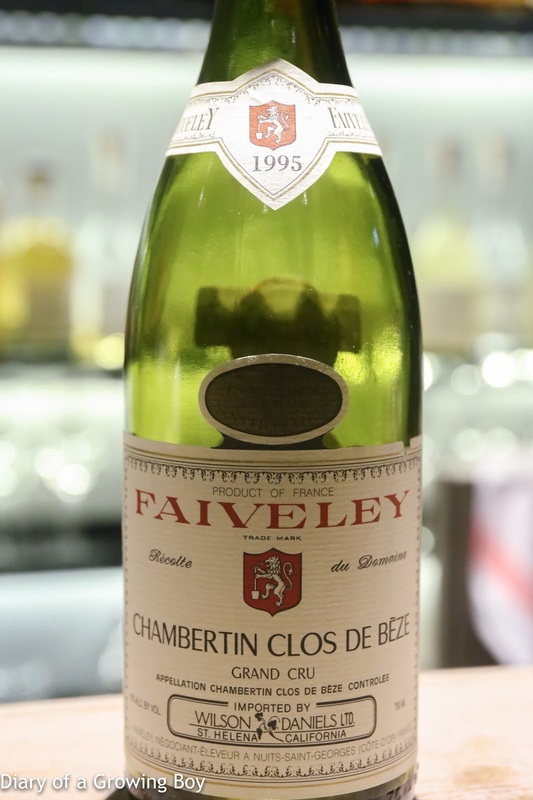 1995 Faiveley Chambertin Clos de Beze - more concentration here. 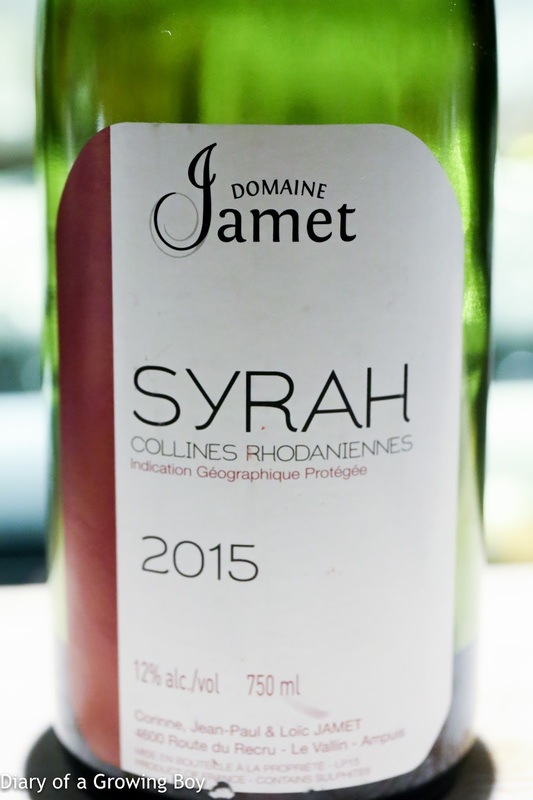 2015 Domaine Jamet Syrah - very ripe and fruity, initially very floral, but later a little pungent and stemmy. 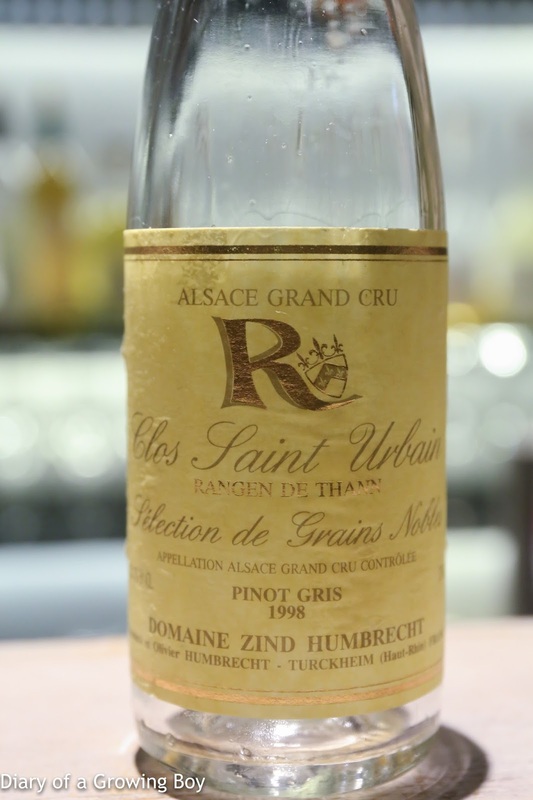 1998 Zind Humbrecht Pinot Gris Rangen de Thann Clos Saint Urbain Sélection des Grains Noble - lots of honey, ripe honeydew melon, and nutty notes. Unctuous.